Continuing an intermittent series of posts concentrating on the Destination data of Luton school leavers (previous posts here and here), this post looks at the number of 16 & 17 year olds in Luton who were in full time education or employment in December 2013. At this time 4,940 16 & 17 year olds were known to the Local Authority and of these 88.2% were in full-time outcomes. This is a fall of 3.3% against December 2012 and the only fall in participation in the Eastern Region and compared to a national figure of 89.8%. This regression is also disappointing compared to the positive news across the country as Local Authorities and schools move to comply with the Raising the Participation age legislation. Of those learners only 1.4% were in an Apprenticeship route, the second lowest in the Eastern Region (behind Southend) which shows that while awareness of this route is growing, the gap between positions sought and those acquired is still huge. 84.1% were still in full-time education. Delving deeper it’s clear where the fall in participation can be attributed. At 16 both girls and boys show healthy figures for participation (95.8% and 96.6% respectively) but at 17 something happens and the figures drop to 82.2% for girls and 78.3% for boys. This is the worst 17-year-old boys participation rate in the Eastern Region. There could be a number of reasons for this; students are signing up to unsuitable courses to begin with (aka the Careers advice is poor), the safety nets to stop them dropping out of Key Stage 5 provision are weak or the provisions themselves do not possess the strength to keep them enticed in the first place. It’s a conundrum that needs solving. Centrelink is a termly e-magazine from the Centre for Education & Industry at the University of Warwick. and is very much worth a read and your consideration. Luton Destination Statistics: Where are our students going? Recently, lots of destination statistics for school leavers have been published by the Dfe. The stats focus on two sets on data, those learners who left education at Key Stage 4 (end of Year 11) and Key Stage 5 (end of 13) in 2010. Added to that, the same data can now be viewed as part of a school’s profile on the Dfe performance tables website. Now, trainspotters confession here, this stuff FASCINATES me. Particularly on a local level as you can see the impact the personalities of different institutions have on the mindsets and outcomes of their leavers and you can fairly quickly identify where good practice is flourishing in the town. The big singing point here is the massive % of learners now going onto any Higher Education Institution from Luton. 61% puts us 9th out of all Local Authorities and is a testament to the fantastic work throughout the education establishments in the town. In fact this figure has the potential to increase even higher as the Barnfield Federation offer more HE routes and local learners find access to such courses even more convenient. The picture isn’t completely rosy though with only 5% of leavers going onto Russell Group Universities and there is scope for improvement here for our IAG work throughout the Key Stages. Meanwhile at KS4 only 5% of leavers are continuing their education in school Sixth Forms which reflects the largely 11-16 tradition of the town with two big FE institutions in Luton Sixth Form and Barnfield College. The NEET figure of 2% (that is the number of learners who spent between 3-6 months from October to March out of Education, Employment or Training) is low compared to nearby Authorities. With only 3 providers exiting students at KS5 is fairly easy to draw distinct comparisons between them. Luton Sixth Form far outstrips it’s neighbors for sending students onto Higher Education with 70% choosing this route but it only ties with Cardinal Newman for students going onto Russell Group Universities with 6%. As Newman has a much lower number of leavers, this shows that the school based Sixth Form is getting a much higher ratio of leavers into these highly competitive institutions. It would unfair to include Barnfield in that comparison as the vast majority of their qualification routes are not suitable for Russell Group entry but it is noticeable that 22% of their leavers are not even included in the statistics as this data was not known or could not be traced. The figures that did strike me were the very low % of leavers from all institutions that went onto Apprenticeships. These figures will be slightly misleading as some learners will be under going an Apprenticeship while at Barnfield but even so, with the rise in the number of Apprenticeships, especially for older learners, I was expecting these figures to be higher. It’s no surprise that two of the highest three schools for the % of students going onto a Further Education College are the two Barnfield Academies. Not all of these leavers will be going to Barnfield College (West’s proximity to Central Bedfordshire College should impact here) but their close sponsorship links with the College are bound to influence leavers choice of routes. It’s also no surprise that the school with the biggest % moving to a school Sixth Form is Cardinal Newman, the only school in the town (at the time) with an established school Sixth Form. Seeing just how large a % of their students Denbigh, Challney Boys and Challney Girls send onto Sixth Form College is an eye opener for me. I’ve always know it was substantial just not that substantial. There are many reasons for this, not least the outstanding GCSE pass rates those schools achieve thus opening A Level routes for their students, but another factor will be that the intake of those schools is mainly from ethnic minority communities (for all 3 their percentage of students on roll for whom English is not their first language is above 88%) who (sweeping generalisaion alert) value and expect their children to inspire to traditional professions that require the academic qualifications only historically offered by Luton Sixth Form. It will be interesting to see how those percentages change with the growth of the Barnfield Sixth Form offer thus increasing the choice of school based Sixth Form route. 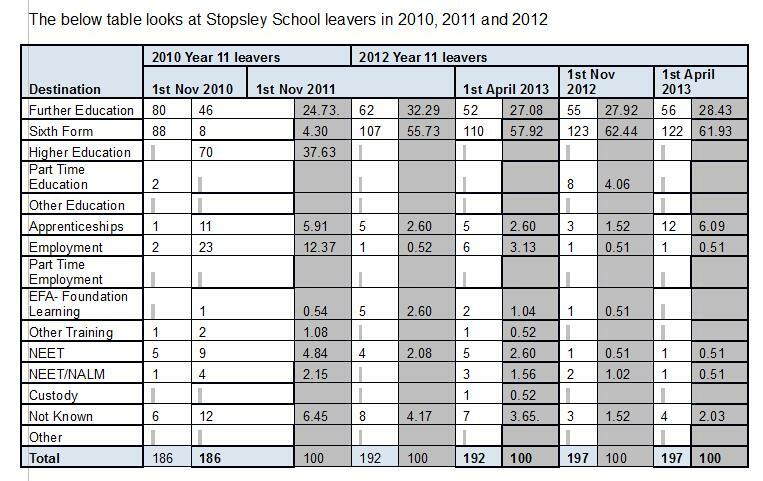 It is also worth noting the that figures for the % of Apprenticeship leavers from Challney Girls is suppressed as it was so small it could have breached confidentiality reflecting the desire for traditional routes. The Apprenticeship percentages across the schools in the town are fairly consistent with my own school tied for the biggest % of leavers taking this route and all of us would be looking to increase student’s awareness of this area. 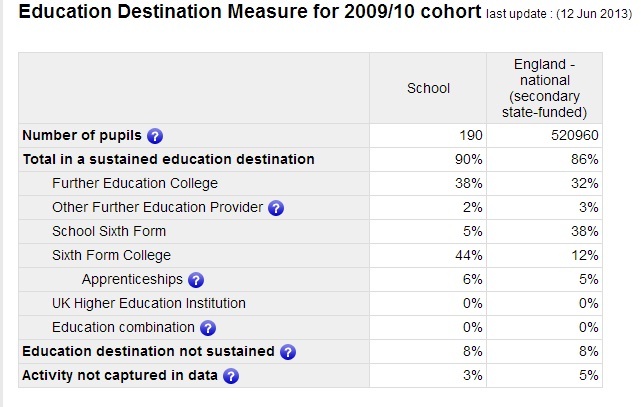 The last set of figures to note is the “Education destination not sustained” column. It’s clear the school to aspire to here is Icknield High. Having only 3% of the largest total cohort of leavers fail to sustain their learning in a suitable pathway is a fantastic achievement and one I will be looking to learn from. and it is worth bearing in mind when you consider them. A few months back, during the feedback for one of my Level 6 face to face observations, a point was made that highlights an interesting tension in careers work for teenagers. During the meeting with the student, she mentioned that there was potential for her family to move overseas once she had finished school. In fact, plans were advanced enough that the family had even identified a couple of possible Colleges she might attend but we were both unclear about how her English qualifications would transfer into the new system. So, we went online, found the College and their admissions department and, together, drafted an email to write to them asking for clarification. I ended this part of the session by making a note in the student’s contact book (like a school diary) to come and see me a week later to let me know if the College had replied. Later in the feedback session, my assessor and I had a conversation about the balance between offering advice & guiding the client’s future behaviour and ensuring that they enact what had been discussed. For me this conversation highlighted a source of tension with providing Careers IAG for young people and the ideal of IAG that is exhorted by the Level 6 and practised with adult clients. Where do you draw the line on how much you actually do for them and how much they do for themselves? As a head of department this phrase used to drive me mad. Good teachers in my department would make this claim when it was suggested we supported students as much as we could to get them to understand, and therefore pass the course. “But when they go to university no one will tell them which bit to read,” or “If I have to correct every part of it…” are arguments that just don’t work. That’s like saying I shouldn’t feed my infant son with anything other than an adult knife and fork as he’ll only have to do it that way in the future. Our job as teachers is to get them over the line that’s set for them and to teach them the right things along the way. Developing independence? Yes, certainly. But don’t use it as an excuse for not giving all the support you can. Build their confidence with all the support necessary, then withdraw the support gradually. Let the university/college/secondary school figure out what to do with them once they get there. as it neatly summarises the same quandary. 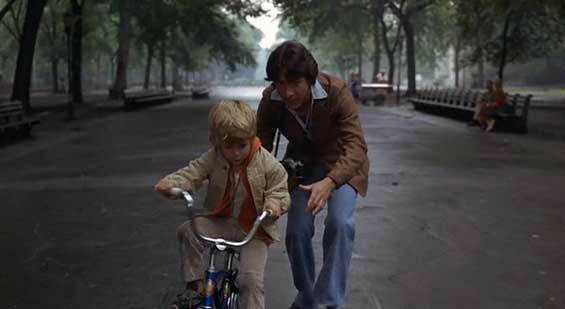 When do those stabilisers get taken away? Because, have no doubt, as students take their tentative first steps into the world outside of school by thinking about their post 16 options or experiencing the world of work for the first time or writing an application for an apprenticeship, we are there, supporting their every move and being those stabilisers making sure they don’t (or as few of them as possible) fall. The world that awaits will expect them to arrive with the skills to use the big knife and fork to borrow the analogy above so the balance has to be found. The increase in destination data for schools and the anti NEET agenda, the expectation from SLT will be that this support will be there for students and will grow in an attempt to ensure positive outcomes. Good Careers education should prepare students to be better equipped for when that support isn’t there which makes the removal of the Statutory requirement on schools to offer this so perplexing. With those pressures, some schools may fall into the tempting trap of never taking that support away. Striving for this balance, between independence and support, is a skill I find myself learning with each student.